Where you will visit the ruins of the temple of Ptah, the fallen colossal statue of King Ramses the 2nd and the Alabaster Sphinx of King Amen phis the 2nd. A short drive from Memphis lies the oldest, ancient cemetery of Sakkara. The world’s first monumental stone building, the Step Pyramid of King Zoser, built by the engineer Imhotep almost 5,000 ago, still stands. After visiting the complex you continue to one of the Mastabas (tombs) built nearby, such as those of Ptah Hotep, Mereruca, Idut or Ti for an inside visit. You will then proceed to the Giza Plateau, where the only remaining Wonder of the Ancient World is found, the imposing Pyramids of Giza. 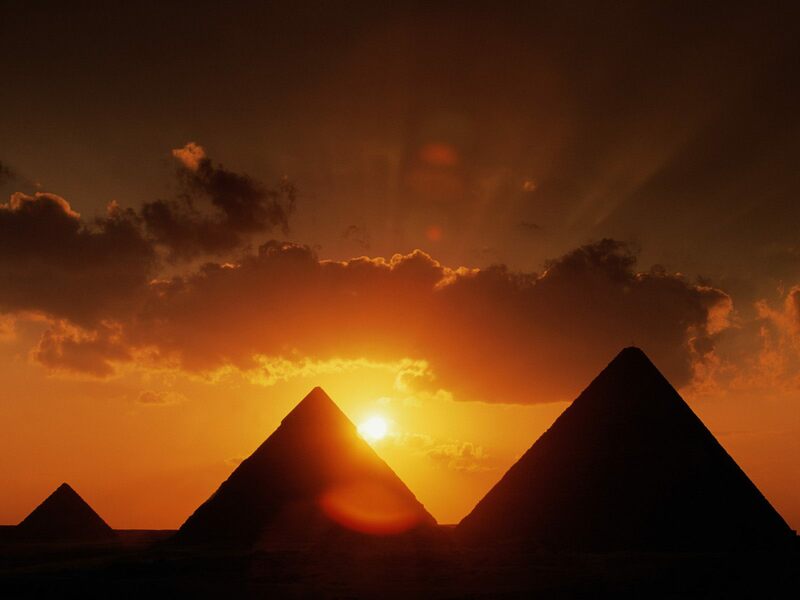 During your visit to the Pyramids you will have time for unique photo opportunities of the three Pyramids from the Western Plateau. Continue down the valley where the guardian of this mortuary complex, the Mighty Sphinx, bears witness to the passage of time and man in eons of silence. A short stop will be made at a Papyrus Institute, where the art of paper making from reeds, discovered by the Ancient Egyptians, will be demonstrated for you. Then you will be back to your hotel. After Breakfast, start your visit to the Citadel of Saladin, where panoramic views of the city of Cairo can be seen. Here you will also visit the spectacular Alabaster Mosque of Mohamed Ali, the founder of modern Egypt. Your next stop will be at the Egyptian Museum of Antiquities where over 120,000 objects in its 107 halls – including the treasures of Tutankhamen (King Tut) – are exhibited. . You will then proceed back to your hotel in Cairo. Gayer Anderson Museum, two houses built in the 16th and 17th centuries reflecting the early Ottoman style of architecture. Fully restored and refurnished by Gayer Anderson, a British army officer who made his home in Egypt, the museum includes his mementos as well. Your next stop will be at Ibn Touloun mosque. Completed in 878AD by the founder of the Toulounid dynasty Al Amir Ahmed Ibn Toulon, it is one of the largest mosques built in Islamic Cairo. It’s open central courtyard measures 92×91 meters and is surrounded by an open corridor. The mosque is known for its rich collection of gypsum ornaments and engravings. The outside staircase of its minaret winding its way from the ground to the top of the minaret makes it unique in Egypt. Continue to Khan El Khalily open Bazaar Area. Afternoon proceed back to your hotel. Note: At the museum there are 30 to 40 marble stairs leading from the ground floor upstairs where the Tutankhamun collection is housed. At the pyramids and Sphinx ground is uneven, cobblestone and sandy. Comfortable walking shoes, hat and sunscreen are recommended. No cameras or videos allowed inside the archaeological museum. Cameras and videos are free at the pyramids. Tour order may vary between groups but all mentioned sites will be covered. After Arrival from Egypt, our representative welcomes you with a sign at Amman Airport after you exit the customs. Transfer about 30 minutes to your Amman Hotel, check in, remainder of the day free.